Well, with a bit of tinkering, my solar car charger is working with the charger turning on automatically when the output from the solar panels is sufficient, but I already have in mind a few improvements. As it stands the system turns off as expected when household demand rises, such as when boiling a kettle, but it takes some time for charging to restart after the signal is sent, presumably down to some logic in the charging equipment. I’d prefer something a bit less dynamic in responding to short term demand changes, but that restarted sooner. The signal from the ImmerSUN tends to turn off too quickly to my mind as, having turn on a relatively big load, it decides there isn’t enough capacity to run a big load. The logic effectively determines that there isn’t enough spare capacity to turn on the load a second time, turns off the load, and then decides that there is enough capacity. To my mind this just cycles the power unnecessarily and, with the delays in restarting already reported, also reduces total energy transfer. Firstly I’m changing the protocol controller than coordinates the handshake with the vehicle. The new one should enable a more rapid restart after interruption without the uncertainties of the delays in the OEM controller. It will also provide an alternative mechanism to stop charging. Instead of suggesting to the vehicle that the cable is about to be disconnected, the new one allows more direct control of the current by resistor selection – or turning on/off via a contact across the resistor. Secondly I’m upgrading to variable current rather than a simple on/off at low current. The new protocol controller documents maximum current choice by resistor selection, but I think that I’ve worked out how to provide infinitely variable current via an analogue voltage. The car will respond to the infinitely variable signal by drawing the highest compatible current from 0, 6, 10 and 14 Amps. Thirdly I’m reconfiguring the output of the ImmerSUN to be more dynamic, but then.. Finally I’m building a module to sit between the transmitter receiver and the protocol controller. The new module will set upper and lower current limits and set the ramp rate / time constant for the system response. My intention is that the result of this is that in response to a jump in available power the controller will slowly ramp up the output to meet the availability and then slightly cycle the analogue output as the ImmerSUN output cycles on and off. The vehicle will respond by cycling between the currents immediately above and immediately below the available current. As an alternative strategy it can be configured to cycle just below the available power, and thus theoretically not import any power from the grid, at the expense of not fully using the available solar power. Which ever strategy is used the more highly dynamic water heating will continue to mop up any available power between what the vehicle takes and what’s available from PV. This entry was posted in Charger control project on 16/04/2016 by Greening Me. This weekend I finished my radio-controlled charger. You may recall that I wanted to link the charging equipment for my electric car to my solar panels so that the car automatically charged when there was enough power from the panels. I’d previously settled on a simple on/off system charging at 6 Amps (the minimum setting) since analysis had suggested that this would maximise energy transfer as it seems to be more important to charge for the most hours than, for example, charge at more current for fewer hours. It seemed that I would be easily able to configure my ImmerSUN to turn the charger on and off using its Relay: Export Threshold feature but I wanted to extend control to my car in the garage some way from the ImmerSUN without running a cable so far. My solution was to make use of a HomeEasy remote control light switch and remotely-controlled switched socket (available on Amazon for example). The switch is designed to send a radio signal up to 30 meters to operate the socket – a range of transmitters and receivers are available separately which can be paired by the user. When I dismantled the switch I found that in normal use the operation of the rocker operated two pushbuttons – one for on and one for off. I removed the pushbuttons from the circuit board and replaced them by cables to the relay outputs of the ImmerSUN. At the same time I reasoned that the button cell in the transmitter might not last very long in service, so instead I repurposed an old mobile phone charger as a power supply. The mobile phone charger was notionally 3.6 Volts, rather than the 3.0 Volts of the button cell, so I also added a simple voltage regulator chip and smoothing capacitor to ensure that I didn’t damage the transmitter from any over-voltage. 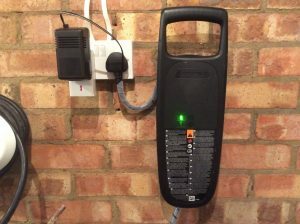 If you simply wanted to switch some mains powered device then you’d need to do little more than plug it into the remote-controlled socket to be able to switch it on and off automatically, but for my car charging equipment I wanted to do something a little more sophisticated. I had previously decided to interrupt a low voltage control signal so that the charging system turned on and off gracefully as if the user was engaged in the normal process of stopping and starting charger rather than forcibly turning the power off as if there was a power cut. To this end I fitted a small mains relay inside an empty case intended for a small power supply like those used for a mobile phone, so that when power is turned on or off volts-free relay contacts open and close. These contacts are wired in series with a push button that normally starts or stops charging so that, as far as the car and charger are concerned, the button release that indicates ready-to-charge doesn’t happen until there’s enough solar power available (by default). I also have the option to manually enable charging or set up a schedule from the ImmerSUN for times when there either hasn’t been enough solar generation or the car isn’t home long enough to benefit from it. All I need now is a reasonably sunny day when the car is at home to try it. This entry was posted in Charger control project on 11/04/2016 by Greening Me. As part of my electric car charger control project I thought I’d try to estimate the benefit of such a system. I’d already decided on resource grounds to do a simple on/off system. The car offers the choice of charging at 6 or 10 Amps. 10 Amps would of course charge more quickly, but would be available for fewer hours each day, so I thought I’d look at what might be possible with 6 Amp charging. My chosen date for analysis was March 16th a day on which we generated 19 kWh. The Immersun provided a hourly profile of consumption and generation through the day which included diversion of 5.4 kWh to generate hot water via the Immersun. For my charging analysis I decided to prioritise EV charging over making hot water (an option within the Immersun) which would result in hot water being generated until 1.5 kW was available, once 1.5 kW was available then the car charger would be turned on, and then as the power increases beyond 1.5 kW then the water heater turns back on to absorb the excess. 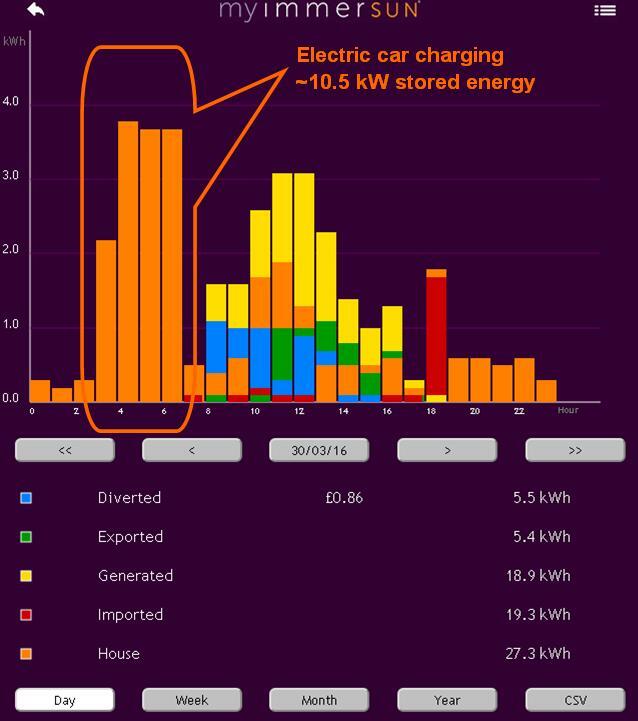 The result of this strategy was that 7.5 kWh was diverted to charge the car, while water heating received 4.8 kWh (a slight reduction on the 5.4 kWh delivered for water heating without EV charging). 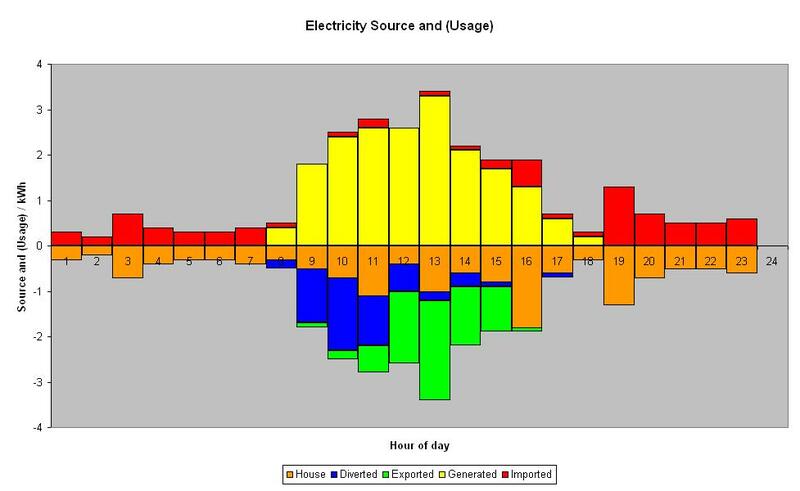 Exported electricity dropped from from 7.5 kWh to 0.2 kWh – so effectively all the available power was used. 7.5 kWh is more than 50% of a full charge for the car and probably exceeds my average daily charge. For the alternative 10 Amp charging strategy only a single hour could provide 2.3 kW for charging (a total of 2.3 kWh) so the 6 Amp charging strategy provided around three times the energy transfer to the vehicle. If the project saved me the same 7.5 kWh from my night time electricity (my current pattern of car charging) that would save me 60 pence per day. Of course I wouldn’t save that every day – some days (particularly in winter) we don’t generate enough power and other days I’m at work (although it should work quite well at the weekend when I spend more of the day at home). Normally I start each day with the car fully charged, but on most days I return with a significant amount of unused charged (typically 50%), but I could choose a charging strategy where I don’t attempt to fully charge each day allowing some charging to be displaced from weekdays to the weekend. It thus gets quite hard to estimate an annual benefit. This entry was posted in Charger control project on 03/04/2016 by Greening Me. In winter when little PV electric is available our normal practice is to shift as much electric load as possible to night time use saving 4.29 p/kWh by use of timers. Washing machine, dishwasher, and electric car charging all get shifted to Economy 7 by use of timers. The washing machine is the oldest and uses a external timer plug while both dishwasher and car have their own inbuilt timers allowing consumption to be delayed. 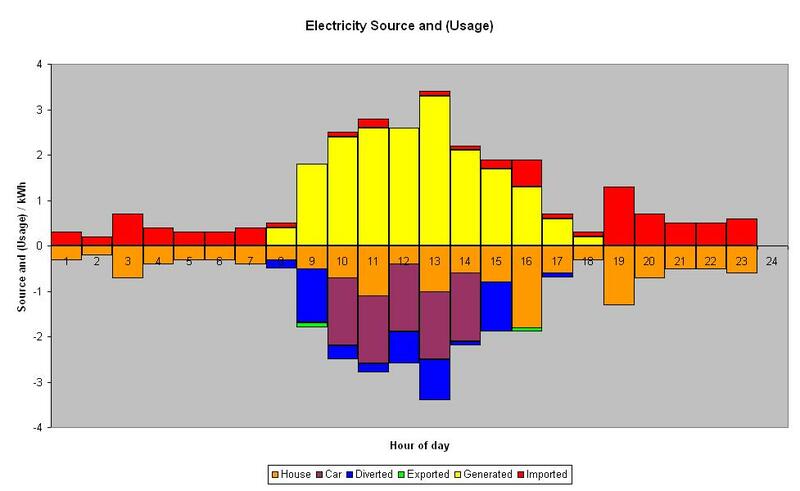 In summer the same approach can be used to shift these loads to daytime to make use of solar PV although if the weather is dull and cloudy there’s no guarantee that sufficient PV will be available risking consumption of bought daytime electricity. My Immersun already minimises exported/surplus PV by running the immersion heater to mop up surplus electricity, although as gas is cheap the savings are smaller than might be achieved by avoiding a similar amount of night-time electricity consumption. In winter we minimise gas use for water heating, while still providing a gas safety net by displacing in both time and temperature. 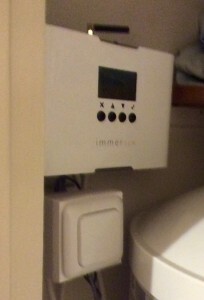 The Immersun naturally heats water in daylight hours only and generates hot water at 60C (not adjustable) as defined by the immersion heater thermostat. The gas is set to complement this being set by timer not to overlap Immersun hours and is set to 50C by the cylinder thermostat. The water temperature difference is not noticeable in practice especially as the showers are thermostatically regulated. The device that consumes most electric power is undoubtedly my electric car. Its usable battery capacity is about 10.5 kWh and, with charging efficiencies, it can take up to 12 kW of mains electricity to charge (less in summer). The appeal of charging this on solar PV is high, although the cost of doing this if it inadvertently draws day-time electricity is also high (but still much cheaper than petrol or Diesel). It occurred to me that it would be good to use spare channels on the Immersun to control car charging as my largest consumer of my most expensive fuel. 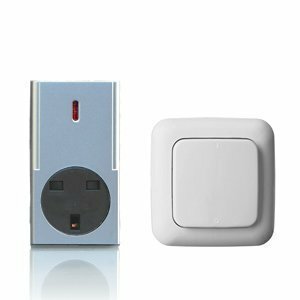 It has three channels – two variable power and one on/off – although it can be configured to produce three variable outputs using the on/off to switch between devices. Proportional control would be the most capable. The Immersun has the capability to provide proportional control to multiple resistive loads, and the Mode 3 communications standard to which virtually all electric cars adhere also provides for the charging equipment sending a proportional signal to the car via PWM, so there’s scope for a proportional system. However it seemed that the time to develop this was beyond what I have available, and in practice although the car would receive a proportional control signal it would normally respond in a stepped manner so there’s little to be gained by investing my time to develop a fully proportionate system.. Stepped control is easier to achieve. As it happens my car model is more steppy than some as I believe that it switches between 6, 10 or 15 Amps consumption only. 15 Amps is very close to the full 4 kW output of my panels and, given that there are always other loads in the house, then I don’t think it would ever use this setting, which leaves me with switching between 0, 6 and 10 Amps. Unfortunately of course you can’t switch between 3 states with an on/off signal that only has 2 states, so I’d still need to decode an analogue Immersun output or invest in a second Immersun to get another on/off output but I deemed the latter cost-prohibitive. Generating a variable current signal to the vehicle would also require some logic to reduce the pulse width on the PWM signal on demand – not impossible but still requiring some time to create. That leaves me with on/off control at a fixed current. This is readily achieved from the Immersun which has a relay output that can be configured to operate when a certain solar power is available (such as 1.5 kW to drive a 6 Amp charger). I decided not simply to turn the whole charger on or off by switching the power as this would cause the mains contactors in the charger and the HV DC contactors in the vehicle to drop out under load which is bad for longevity. Instead I’ll interrupt a low voltage control signal within the charger to trigger stop and restart in a more controlled manner – effectively car and charging equipment will see the signal as the user wishing to disconnect the cable as you might if you wished to drive before charging was complete. Finally I considered how to connect the Immersun to the charging equipment. Unfortunately the Immersun is in the airing cupboard upstairs (where it drivers the immersion heater) and the garage where the car charges is a separate building alongside the opposite side of house. Neither a second Immersun or a physical cable looked like an attractive prospect on cost grounds so I decided on radio control using around £20 of home automation parts and a total investment of around £40. More on this solution over the next few weeks. This entry was posted in Charger control project, Energy, Gas, Water heating on 02/04/2016 by Greening Me.